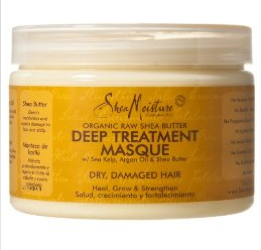 Shea Moisture Organic Raw Shea Butter Deep Treatment Masque, I give this product a 3.5 out of 5 stars. It smells wonderful but has no slip what so ever so it is not good at loosening tangles from your hair. My hair doesn’t feel soft before or after rinsing it out which is something I look for. But, once my hair dries my hair is soft and has shine. I have also seen in reviews that a lot of people prefer to use this as a leave in cream rather than a deep treatment masque, I tried this as well and I’m ahhhhhh…. about it. I’ve had better deep treatments so 3.5 stars it is! Contains de-ionized water, Butyrospermum Parkii (Shea butter) (denotes certified organic ingredients), Argan oil, vegetable glycerin, emulsifying wax, sea kelp extract, Panthenol (vitamin B-5), essential oil blend, avocado oil, Lonicera Caprifolium (honeysuckle) flower and Lonicera Japonica (Japanese honeysuckle) flower extract, Tocopherol (vitamin E), Hyssopus Officinalis Extract, Salvia Officinalis (sage) leaf and Equisetum Arvense Extract, soybean oil and Daucus Carota Sativa (carrot) seed oil. Have you tried Shea Moisture Deep Treatment Masque? Your thoughts? I have mixed feelings about this product, but I use it as a deep treatment because it is the cheapest and most available all natural deep treatment option in my town (outside of a conditioner). I always add a tbsp of honey and olive oil to it though. I tried it once without the additions and it did nothing. Since i don’t want to use my conditioner for co-washes and deep treatments, I’ve stuck with this, but it is not amazing. I conditioner my hair with Audrey GPB after using this. This product on its own in insufficient for me. I’ve been generally disappointed with Shea Moisture products. Wow! You have smooth loose curls and this product does not work on you. I have 4a-4b hair and I had the same results. I felt as if my hair did not absorb it. I used it once and had to rinse it out after 20 minutes and apply another conditioner inorder for my hair to feel soft and moist. I’m not a fan. It did not absorb into my hair, even with my steamer. To be fair, my porosity is super low and my hair doesn’t seem to like Shea butter so … yea. I have a lot left over, so to use it up I wet my hair and use it for flat twists or bantu knots when my hair is super parched. If I give it two days to absorb my hair comes out pretty soft. I rarely do it because it takes too long to sink into my strands, but I like it better that way than as a deep treatment. this product used to be really good before it hit stores like target. Im not sure what changed in the ingredients but it used to moisturize really well. LOVE THIS PRODUCT… It’s excellent for children. I use this product weekly as a deep treatment. Yes, I have to leave it in for 30 – 45 minutes, but it works. I’ve had this since January, and I use it along with the moisture retention shampoo and conditioner. I don’t love it, but I like it. I like it because it makes my hair feel strong and moisturized, rather than over-conditioned. I wanted to like it, swear I did. But it left my hair smelling not so bueno. Definitely not to be used before a wash and go style. They need to make a coconut and hibiscus deep condish. I wanted to like this product because I love their hair milk but the masque leaves my hair feeling dry and not at all conditioned. My staple is Jessicurl deep conditioner, I started leaving this in my hair instead of rinsing out and I love how soft and moisturized it feels. I heard that the Shea Moisture masque that has the black label is pretty good. I don’t remember which one it is, but it is sold at Walgreens. People that hate the one you tried gave more favorable reviews on the other one. I thought I should let you know! I’m glad you and others have rated that product, so I will not purchase it in the future. I don’t need another useless product. Thanks! its the purification masque and i luv it. hair feels SO good afterwards. I agree 100% My hair is low porosity and this product is not good at all on my hiar!!! I’m just trying to use it up because I paid 10.00 for it! 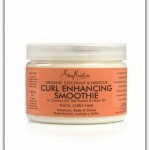 I naturally have high porosity hair and my hair loves this stuff. My hair loves all the Shea Moisture line for the most part. yea i agree! I’ve used this twice and now I’m kinda over anything w/ a large amount of shea butter in it. over time I noticed that my twists & twist-outs were becoming a bit dull when using this. but it’s great for locking in moisture! and like some other ladies who commented earlier, my hair has low porosity as well so it took a while (over night) to fully absorb. I agree that by itself it’s not the bomb.com. BUT I didn’t want to waste my money so I threw my oils in there and voila it was awesome! I used castor oil, jojoba oil, peppermint and tea tree for itchy scalp and olive oil…I think I used vatika once too. It’s great that way. It’s a great base but not great alone. I did not enjoy this mask either. I had such high hopes for it but it left my hair extra dry (as does Carol’s Daughter smoothies). However I did enjoy the shampoo. It was just ok for me. My hair does not like large amounts of shea butter either (I just perfected my own shea butter mix, but I don’t even use that all the time). The smell for me is OVERWHELMING, lol. Omg. It is soooo heavily perfumed, and yes, I realize smell is in the nose of the beholder ha. It does ok as a sealer, but as a DC, ehhhh. This totally dried out my hair on it’s own, so I’ll add some oils to it as suggested and see if that works better. I hate throwing stuff away if I can improve it with a little help from my friends (oil friends, that is)! Maaaaaaannnnn … I sure wish I had read this before I used it. As soon as I rinsed it out, I knew it was a FAIL. My hair felt sticky and dry. I too look for that immediate soft feelinf after DC’ing. I had to immediately apply my leave in, which thankfully softened my hair … Won’t be using this again. I haven’t tried the deep treatment mask as a deep conditioner, but i did use it as a styling product. instead of wetting my hair with water i parted my hair in small sections and sprayed each section with the shea moisture coconut hibiscus curl and shine, then i lightly dabbed my finger into the deep treament mask (very little) and applied to the sprayed section and evenly distributed it using fingers to seal it i used the jamaican castor oil (solid form) using very little and applied to the treated section and added both treatment and castor oil once more to the ends of the hair. after running fingers down the hair i twisted the section…repeated til completed the entire head. as a result once it fully dried i was left with soft, shiny, bouncy twist. it has been 4 days and my hair still looks and feels the way it did the first day it dried. I plan on seperating the twisted strand in 3 days to where the twist out look for a cpl days then will do it over again. my hair usually dries hard/stiff crunch and dry, but i had very soft and sheen hair using the products above. I have used this product for several months as a deep conditioner and have found it to work great! I’m 4a and really need the softness that it gives. Never tried it as a leave in because I use there other Shea moisture leave in,but will give it a try. I have this product and I’m a new natural. I only used it once and I must say that I didn’t like it when I washed it out but I did like it when my hair was dry. The smell to me is a little strong but it’s not bad. I have seen a lot of people using this for two strand twist and I personally don’t think I would. Shea Moisture Products are working for me but I would like if somebody with natural hair can help me out with some questions that I have. Thank- you! That is a very good treatment in giving a deep treatment of those people who have a dry hair to give some moisture that will surely give them the fullest satisfaction that they wanted. i bought it last night and absolutely love it! i use it as a sealant with elasta qp mango butter. but thinking of changing up my moisturizer. two butters seemed like too much for my hair. but i love the softness it delivered.